Canadian Imperial Bank of Commerce, also known as CIBC, is the 5th largest bank in Canada. CIBC provides a full range of financial service products and services to 11 million individual, small business, commercial, corporate and institutional clients in Canada and around the world. Historically, CIBC is the merger of the Canadian Bank of Commerce (Established in 1867) and the Imperial Bank of Canada (Established in 1875) which took place in 1961. It represents 144 years of banking business. CIBC is not currently in a leading positions compared to the other top banks and is working hard on growing and competing with the other big boys. It's targeting to be #3 while eyeing #1 or #2 spot. I have to say that it's not a small target to reach the top 3 when you consider that all the other banks are aggressively expending. They target a 40%-50% dividend payout with a shareholder return greater than the S&P/TSX Composite Banks Index (dividends reinvested) on a rolling five-year basis. In short, they are saying that you, as an investor, will do better with CIBC than half of the other financial institutions involved in retail banking (could be a life insurance company). That's quite a bold statement. Some quick facts on CIBC. The one year graph shows a decent 19.43% growth in value. It's on par with the S&P TSX index but it doesn't include the 4.57% dividend yield though. That would give a 24% return on investment for 2010. CIBC's dividend growth is decent but not an aristocrats. For the banks, I am willing to forgive not increasing dividends through 2009 and 2010 due to the Basel III rules but CIBC happens to have held its dividend back in 1998 and 1999. The dividend growth graph may look decent but CIBC's 5 year dividend growth average is at 5.67% while the other banks exhibit a much higher average growth. 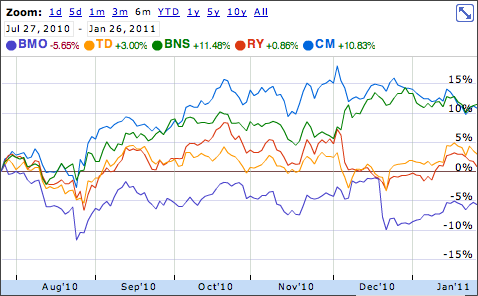 Here is the 5 year dividend growth average for the top 5 banks. 3 of the 5 banks held their dividend rate fixed for 2009 and 2010 while the other 2 held it for 2010 only and they still managed to have a nice dividend growth average for the past 5 years and CIBC is lagging behind. 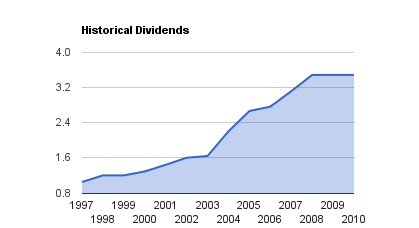 The dividend payout ratio is a little erratic as you can see with 4 of the last 9 years paying above 100%. 3 of these 4 years are due to CIBC having negative earnings. I decided to represent them at 100% since it clearly paid more than it earned. In 2002, the payout was actually 117%. The 5 year average dividend payout is 65.86% and out of range of their 40%-50% target at the moment. I took a snapshot of the last 6 months and CIBC performed quite well on the market. The erratic dividend payout ratio and the lack luster dividend growth don't seem to be holding it back. The high yield may be what is keeping the value up. The P/E for CM is definitely attractive at 12.95 and below average of the other top banks. It's interesting to see the premium investors are willing to pay for the top 5 banks while National Bank and Laurentian Bank are staying just about below 12. 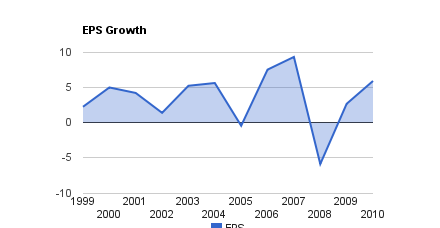 Even with a decent P/E based on today's data, the earnings per share for CIBC have not been as consistent over the past decade which is concerning. The delta is pretty wide in some cases which should be a cause for concern. I have not read further as to why it hit rock bottom in 2 occasions but it should be researched to understand management better. If you do business with President Choice Financial, you're essentially generating revenue for CIBC through the partnership CIBC has with Loblaws. The erratic payout ratio and earnings is making me cautious. I may need a couple more years to see it steer away from the wild swings. The yield is definitely attractive but there are other options. I feel that management has worked hard to not reduce the dividends but any future challenges may require a reduction. Readers: Do you own CIBC? What do you like about it? Full Disclosure: I am long with BMO and BNS.